Settled on the GeForce RTX 2060 as your next graphics card? A fine choice, as Nvidia's latest x60 GPU serves as a useful upgrade path for gamers on previous-generation hardware. Prices start from £329, and for your money you're getting solid gameplay credentials at FHD or QHD resolutions, as well as the promise of a forward-looking Turing architecture. The question that remains is do you opt for the tried-and-trusted Founders Edition, or should you lean toward a custom-cooled partner card? We've already taken a closer look at offerings from Asus, EVGA and Gigabyte, with mixed results, and today we turn our attention to Palit's GeForce RTX 2060 GamingPro OC. It is quite clear that Nvidia's partners are feeling the squeeze when it comes to margin, and with the Founders Edition doing a stellar job at £329, there's little room to manoeuvre. Do too much and your card can be priced out of reach - the ROG Strix comes to mind - but do too little and there's no real incentive to tempt users away from the FE. Palit lands on a somewhat satisfactory middle ground by charging £350 for a card that is factory overclocked and able to run both faster and cooler than Nvidia's reference board. Indeed, the small six per cent premium makes this one of the more palatable partner cards around and, up until February 25, the price point is helped by a promotion that makes any RTX 2060 purchase eligible for a free copy of either Battlefield V or Anthem. But being competitive on price doesn't change the fact that the more affordable custom RTX 2060s tend not to be as pretty as the Founders Edition. If you appreciate the way your graphics card looks and feels, there's no two ways about it; the FE is downright gorgeous, the GamingPro OC decidedly less so. Palit's design excludes a backplate, revealing a bare PCB, the white LED strip across the top comes across as cheap, and though the plastic shroud on the front is rigid enough, it doesn't exactly exude quality. Still, if you don't have a windowed chassis, none of that should matter. What's perhaps more important is that the RTX 2060 GamingPro OC weighs just 653g and measures 235mm x 112mm x 40mm. That's a fraction longer than the FE, yet this remains a dual-slot solution that ought to fit into most systems with ease while putting minimal strain on the PCIe slot. And let's face it, the pared-down TU106 GPU employed by RTX 2060 doesn't need a hulking heatsink and cooler or multiple power connectors in order to function at respectable speeds. 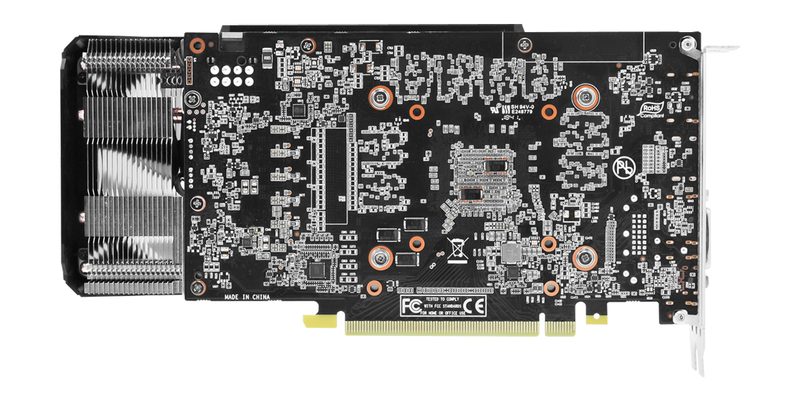 Palit's GamingPro OC is lightweight and requires just a single eight-pin connector, yet is factory overclocked to the same 1,830MHz boost clock featured on much larger, heavier and pricier competitors. The 6GB GDDR6 frame buffer remains cemented at the default 14Gbps, but we expect out-the-box performance to be as good as you get for an RTX 2060, and comfortably quicker than the FE. The on-paper speeds are in line with expectations, and as tends to be the case there's room for more. When installed inside our quiet test platform, the GPU would routinely run within the 1,935MHz to 1,980MHz range. No qualms there, but GamingPro OC does miss out on a couple of features that some of the competition tends to offer. The first is that the fans don't switch off at low load. 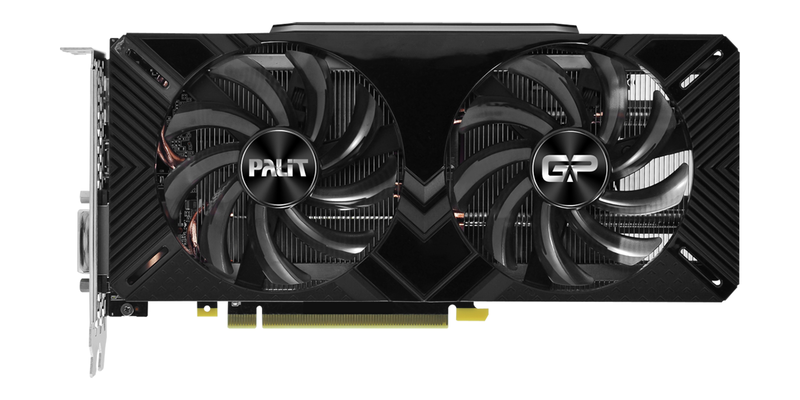 Palit's dual blowers aren't particularly vocal - the benchmarks will back that up shortly - but if you are aiming for absolute silence, this isn't the graphics card for you. Secondly, and perhaps more importantly, the selection of outputs is surprisingly sparse. We've seen most AIB partners drop USB-C, presumably as a cost-cutting measure, but Palit also ditches the second DisplayPort, leaving just one of each of three output types; DisplayPort, HDMI and DVI. Those seeking overall refinement will rightly gravitate toward the Founders Edition, but the brute-force approach never does any harm, and GamingPro OC's factory overclock ought to make it the fastest £350 solution in our charts. Let's see if the benchmarks concur, shall we?